Institute of Banking Personnel Selection (IBPS) has released schedule of upcoming exams which will be held in the year 2015. 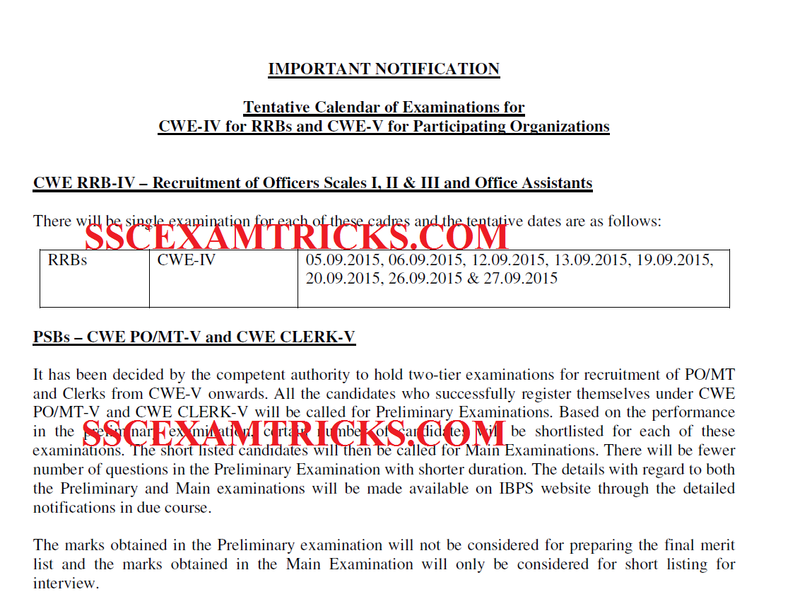 These IBPS CWE V Exams are schedule on various dates in months of January to December 2015 on stipulated dates & time. The latest News is that IBPS CWE V Clerk/PO/MT/RRB/SO has released upcoming exam schedule in PDF which is available on the official website of IBPS for which direct link is mentioned in the end of the post. IBPS has made several changes for candidates to apply online for the application for IBPS Clerk/PO/MT and major change in the exam pattern of IBPS. IBPS is going to conduct two examinations for the selection of Clerk/PO/MT for various bank follow IBPS Score. These two examinations are Pre-Examination & Main Examination. IBPS has released the tentative schedule of Preliminary Exam and Main Exam on various dates of month from January to December 2015. All the candidates who register online for IBPS Clerk/PO/MT Exam will be called for Preliminary Exam and Based on the performance in Pre-Examination, candidates will be shortlisted for Main Examination. The Preliminary Exam will be short duration exam which will be conducted for qualifying nature. No mark of Preliminary Exam will be considered for Merit List of the candidates called for Interview. The detail of both of the marks of Preliminary & Main Exam will be released on the official website of IBPS. As per IBPS “The marks obtained in the Preliminary examination will not be considered for preparing the final merit list and the marks obtained in the Main Examination will only be considered for short listing for interview”. The IBPS Clerk Pre-Exam 2015 will be scheduled on the various dates in the month of December 2015 & Main Exam in the month of January 2016. The IBPS PO/MT Pre-Exam 2015 will be scheduled on the various dates in the month of October 2015 & Main Exam in the end of month October 2015. The IBPS RRB CWE IV Exam 2015 will be scheduled on the various dates in the month of September 2015. There is a single exam for the posts of Officer Scale I, II & III and Officer Assistants (Multipurpose) and selection will be done on the basis of performance (Merit Base) in exam for the various banks follows IBPS score. There is no change in exam pattern of IBPS RRB CWE IV Exam 2015 released by IBPS on the official website. The IBPS CWE V Exam will be scheduled on the various dates in the month of January 2016. There is a single exam for the posts of Specialist Officers and selection will be done on the basis of performance (Merit Base) in exam for the various banks follows IBPS score. There is no change in exam pattern of IBPS CWE V Exam 2015 released by IBPS on the official website. · Notification will be released on official website of IBPS through ONLINE Mode of Application. · Candidates are advised to read complete advertisement before applying for ONLINE Application. · The ONLINE application requires academic marks detail of the candidate. · It also required a scanned colored photograph & a scanned signature of the candidate in prescribed size and format must be JPG or JPEG. · There is no OFFLINE Mode follows fee deposit by Computer Generated Challan mode in bank or other. · In the end click on the submit button. · Take printout of the computer generated application form. Take hard copy for future reference.